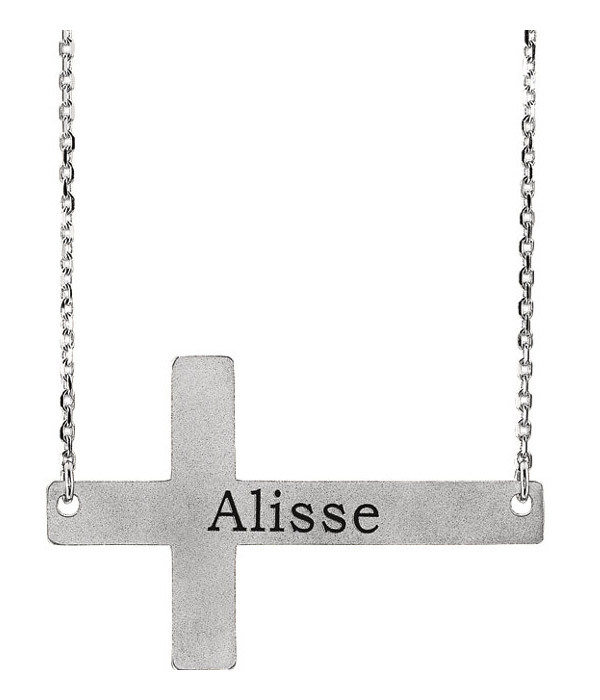 A personalized and engravable sideways cross necklace made in .925 sterling silver with a textured finish and your name engraved on the front, with up to 8 letters. Also available in white or yellow gold, shown below. The personalized sideways cross measures 1 3/16" long x 3/4" tall and includes a matching 18" sterling silver cable chain. Made to order in the U.S.A.! "Hast thou not known? hast thou not heard, that the everlasting God, the LORD, the Creator of the ends of the earth, fainteth not, neither is weary? there is no searching of his understanding" (Isaiah 40:28). 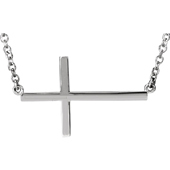 We guarantee our Engravable Sideways Cross Necklace in Silver to be high quality, authentic jewelry, as described above.